Evelyn Ashford (slso known as: Mrs. Ray Washington) born April 15, 1957 in Shreveport, Louisiana, United States is an African-American athlete. Sprinter Evelyn Ashford once told the Washington Post, "There's nothing wrong with second, but I only want to be first," and for most of her career, that is exactly what she was. In 17 years on the track, the five-foot-five sprinter broke world records, was ranked best in the world 14 times, and earned five Olympic medals. Known for her record-breaking speeds in the 100-meter run, the event in which she earned her first gold medal, Ashford was also a powerhouse in the 100-meter relay, helping the Team U.S. win three consecutive gold medals in the 1984, 1988, and 1992 Olympic Games. This final medal was earned when Ashford was 35 years old, a testament to her impressive longevity. Nearly 15 years after retiring from the track, Ashford's name is still carved on the record books, emblazoned in Halls of Fame, and revered by fans of track and field worldwide. Evelyn Ashford was born on April 15, 1957, in Shreveport, Louisiana, the first of Samuel and Vietta Ashford's five children. Because Samuel's Air Force career kept the family on the move, it wasn't until they settled in Roseville, California that Ashford, whose long-time hero was the great African-American sprinter Wilma Rudolph, got serious about running. There was just one catch. Roseville High School did not have a girls' track team. However, when a school coach noticed Ashford's speed on the playground, he challenged her to race some of the football players. When she beat the school's star running back in a 50-yard dash, Ashford became a playground hero. Bucking gender lines, the school put her on the boys' track team and Ashford went on to place third in the Junior National Track Championships in 1975. In her senior year, she co-captained the team and upon graduation she became one of the first female athletes to win an athletic scholarship to UCLA. As a collegiate runner, Ashford continued to draw attention for her speed on the track. UCLA track coach Pat Connolly, a three-time Olympian herself, saw Olympic potential in Ashford and took the young runner under her wing. Together, they worked on a training plan that primed Ashford for the 1976 Summer Olympics in Montreal. Just a freshman in college, Ashford came in fifth in the 100-meter race and 7th in the 4x100-meter relay, a team event that involves four runners completing a 100-meter leg of the race. Back at school, Ashford won national collegiate championships in both the 100- and 200-meter runs and the 800-meter relay. 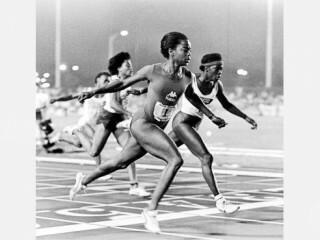 However, the Olympic bug had bitten and after her junior year, Ashford dropped out of college to train full-time for the 1980 Olympics. That same year, she married Ray Washington, a UCLA basketball player. At the 1979 World Cup, Ashford beat world-record holders in both the 100-meter and the 200-meter races. These wins pegged her as a favorite for the gold medal at the upcoming Summer Olympics in Moscow. Unfortunately, in December of 1979 the Soviet Union invaded Afghanistan. In response, then-U.S. president Jimmy Carter initiated a boycott of the Moscow games. Ashford was devastated. She and husband Ray took off for a cross-country road trip where the runner found both the solace and the strength to set her sights back on the track. The following year, Ashford once again scored world titles in both the 100-meter and 200-meter races at the World Cup in Rome. Then in 1983, she stunned even herself with a 100-meter race at the National Sports Festival in Colorado Springs. "I wasn't thinking about anything; I just ran," she told Sports Illustrated. "When I crossed the line, I thought, 'That was nothing special. Maybe 11.1.'" She soon found out that she had clocked in at 10.79 seconds, a world record that earned her the nickname, "world's faster woman." Following her world record run, Ashford was the favorite to win the upcoming World Championships in Helsinki, Finland, however a pulled hamstring muscle kept her from finishing the finals. Later that year, running in the 1984 Olympic trials, she once again felt a tug in her hamstring. Though she still managed to qualify for the games, the injury made her rethink her running strategy. She decided to stick only with the 100-meter race as the 200-meter carried too much potential for damage. Her plan worked. When the gun went off marking the start of the 100-meter Olympic run, Ashford flew. "I didn't feel that much in control," she later told Sports Illustrated. "I felt that my legs were moving too fast for my body." When it was over, Ashford had not only won the gold, but she had set a new Olympic record for the event, 10.97 seconds. As the medal was placed around her neck in front of a stadium full of her screaming hometown fans, the normally reserved Ashford wept openly. "The response in the Olympic stadium today tells me that I'm very much appreciated," she told Sports Illustrated. Before the Los Angeles games were over, Ashford scored a second gold medal with the American 4x100 relay team. However, she was not done yet. Later that year, she broke her own world record in Zurich when she clocked the 100-meter run in at 10.76 seconds. As of 2007, her time still stood as the fifth fastest in the history of the event. In 1985, Ashford slowed down just enough to have a baby. By the following year, she was back on track, her feet flying directly towards the 1988 Olympics. Despite another hamstring injury which kept her out of the 1987 World Championships, Ashford won all but two of the races she entered. She expected to do the same at the Seoul Olympics, however a new force was about to be unleashed on the track. During the 100-meter race, teammate Florence Griffith-Joyner stunned the world with an unprecedented finish of 10.54 seconds, good for the gold medal. Ashford took home the silver. "I'd never been beaten in a major competition before," she later told the Washington Post. "In 1976, I ran in the Olympics at 18 and finished fifth. After that, I won. I'm a winner." Ashford did win one gold in Seoul as part of the 4x100 relay. With three Olympic gold medals, one silver, two world records, and several world championships under her cleats, Ashford could have retired a champion just then. By the time the next Olympics rolled around, she was 35, well beyond gold-winning age for track. Ashford, however, was not ready to quit. She made the Olympic trials and joined the U.S. track team as the oldest runner at the 1992 Barcelona Games. Though she was edged out of the 100-meter semi-finals by 1/1000th of a second, she finished first with the 4x100 relay team, winning her fourth Olympic gold medal. A year later, she finally retired, dedicating her life instead to raising her daughter and promoting literacy causes. Along with her old coach Connolly, she also became a vocal activist against the use of steroids in Olympic sports. Within a decade, Ashford had become a legend. She was inducted into the National Track and Field Hall of Fame in 1997 and into the U.S. Olympic Hall of Fame in 2006. Her picture has now joined that of her old idol Rudolph on the bedroom walls of girls across the country who hope to one day fly in Ashford's footsteps. Sprinter, 100-meter, 200-meter, and 4x100-meter relay, 1975-93. View the full website biography of Evelyn Ashford.